Unless you’re one of those annoying people who have their holiday shopping done by Halloween, this is probably the time of year when the panic sets in and you start racking your brain to figure out a gift for everyone on your list that’s thoughtful and appropriate and not cheap but not too expensive AND won’t look last minute. It’s rough. We know that feel. And we’re here with a delicious and unique foodie gift guide that will totally make you look like you’ve been planning for months. Is there really anyone out there who wouldn’t like spreadable bacon? And as if that wasn’t enough, the geniuses over at The Bacon Jams have already come up with two awesome flavors besides the original – Red Chili and Garlic and Black Pepper. It’s delicious on burgers, pasta, a shoe – basically anything at all. You’ll win the holidays from now until the end of time. Try all three jams on the Love With Food shop and then check out all the other awesome products on their website, like bacon salt, bacon-infused maple sugar and BACON CARAMEL CORN. Kiss those boring weeknight meals goodbye. These sauces inspired by Indian flavors will take any dish our of this world. Season a steak, squeeze onto a hot dog, or even try them on pizza! 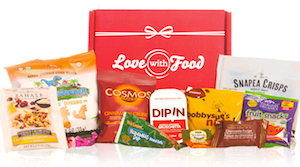 You can buy all five flavors on the Love With Food shop, but don’t cheat yourself by passing over all of the Bandar Foods products on their site. Yeah yeah, we know what you’re gonna say. “Ooh chocolate, how original for the holidays.” Just listen to this: Dark chocolate with ginger and orange, milk chocolate with toffee and espresso, dark chocolate with hazelnuts and cranberries…getting our drift? This is not your grandma’s chocolate. Go buy some and see for yourself. Made by a guy in Michigan who grew up eating his dad’s renowned toffee recipe, this stuff is like crack. Not too crunchy and break-your-teeth-y, and using real ingredients. And boy does it pay off. The dark and milk chocolate flavors are classically scrumptious, although the peanut butter might just give you a religious experience. And yes, you can go buy them all right now in the Love With Food shop. We know you wanted to ask. Talk about a great concept. Take everyone’s favorite dessert, stick it in a jar and sell them so people can bring them EVERYWHERE. And I’m not just talking the standard flavors like lemon and apple pie (although they have all of those) but uniquely mouthwatering varieties like pumpkin bourbon pie, fudgy mint chip pie, and pecan gingerbread. Head over to the Love With Food shop and order the yum. Oh, and did I mention they do jar cakes too? And everything can be customized exactly how you (or the lucky giftee) likes it? And heaven is real? The geniuses behind ReGrained products took all the great ingredients that go into an awesome snack bar (like oats, honey, coffee and chocolate) and combined them with the grain left behind after beer is made (from a local brewery, no less) to make some truly unique and delicious snacks. Can you think of someone on your list who WOULDN’T want to have their beer and eat it too? Order both the Chocolate Coffee Stout and the Honey Almond IPA in the Love With Food shop – but maybe order a few extra for yourself too. What’s better than gifting chocolate? Gifting chocolate smothered over pretzels and caramel. Enter Snappers to fill a hole in your life you never knew you had. Need a gift for someone who’s not a huge caramel fan? If only they had another flavor…BAM! They’ve got peanut butter. Are they more of a dark chocolate person? Snappers has you covered there too. The only negative response you’ll get from giving these as a gift will be about why you didn’t give them five bags. Anyone who says tea is boring has never tried David’s Tea. Period. You’ll find all the flavors you’re used to like Earl Grey and green tea, but don’t miss out on the Banana Nut Bread, Electric Lemonade, and Mint Chocolate Rooibos. And not only are their teas delicious, they’re gorgeous too. Buy a box of Glitter and Gold and you’ll see what we mean. This will make you forget all about that regular stuff you’re used to spreading on toast. Delicious, flavor-packed, high in omega 3s and fiber, and made without preservatives, additives, colors or flavorings. With all of that to consider, we won’t judge at all of you decide to buy every flavor. No really. Go order some from their site today. Everything is fancier when biscotti gets broken out, right? Nonni’s has been making it with the same recipe straight from Italy for more than a century. You’re getting the real thing here – crunchy, rich and light at the same time. If the intended giftee is a bit of a purist, their Original flavor will rock their world – but Nonni’s Toffee Almond or Turtle Pecan might just blow their mind. While you can’t buy their biscotti online at this time, it’s easy to find them in a store near you. We all know the problem: The minute you put on a nice white shirt, the universe shifts in such a way to make sure you spill something heinously messy like red wine or tomato sauce all over it. Sigh. The folks over at Elizabeth and Clarke (who have already nailed the subscription shirt service, BTW) know that feel, so they created a shirt that will. Not. Stain. Seriously. Got a loved one who tends to get a little messy when cooking (or maybe it just a tad klutzy)? Yeah, we know you do. Right now the shirts are scheduled for a Spring 2016 delivery, but you can pre-order them now and sign your loved one up for Elizabeth and Clarke while they wait! By now we all know that popcorn is no longer just something to munch on during the movies – it’s becoming a culinary art form. 479 is on the frontier of mind-blowing popcorn flavors, which make perfect gifting material for a foodie. They’ve nailed the classics like Sea Salt (which so happens to be a whopping 61% off in the Love With Food shop) and Creamery Butter, but if you’re looking to get a frame-worthy thank-you note, give your loved one a bag of the White Cheddar + Black Truffle along with a Pumpkin Pecan Praline (cough also available now at the Love With Food shop cough). Boom. We all have that one friend or family member who always gets recruited into baking six dozen cookies for a party or a birthday cake on an hour’s notice. This year, make the baking a little easier on them with these pre-measured and smartly packaged cookie kits, because the least fun part of baking anything is all the measuring. (Hint: give them one on the flavor you like best, and don’t be surprised if you end up getting a little gift back in a few days.) They’ve all been measured just right to produce the perfect chocolate chip, oatmeal raisin, or sugar cookie in no time. Order all three from the Love With Food shop hassle-free. And guess what: Scratch and Grain makes gluten-free kits too (also featured on the Love With Food shop, just for your convenience). These days there are plenty of gluten-free pastas, breads and flours out there, as any gluten-free foodie knows – but not all are created equal. Manini’s is the real deal. The founders set out to create gluten-free products for their own daughter, and did they ever succeed. If your gluten-free loved one is a baking fiend, order them a bag of gluten-free flour (Manini’s makes it in multi-grain too). Maybe they’re a fan of Italian? Gift them a package of Manini’s awesome ravioli. If that last gluten-free person on your list is a bit picky about sugar or GMOs, Purely Elizabeth is the answer. Their delicious and organic products are vegan, non-GMO, free of refined sugar and anything artificial, and packed with ancient grains. It doesn’t really matter what you give as a a gift – the oatmeal, granola, cookie mixes, or even a Purely Elizabeth cookbook – the person lucky enough to receive it will be hooked. Know someone who’s recently gone gluten-free and could use a little help at mealtime? Gluten-Free Frenzy’s Chandice Probst and Tana Besendorfer literally wrote the book on delicious, nutritious and entirely gluten-free meals that won’t send the grocery bills through the roof. At Love With Food we’re big fans of Chandice, so trust us, your loved one will be in good hands. They might just invite you over for dinner and wow you with a meal so scrumptious you’d never realize it was gluten-free. How about a gluten-free gift that keeps on giving? Gluten-Free Forever Magazine is a quarterly publication dedicated to everything that is awesome about being a foodie and being gluten-free. Recipes, cool new products, interviews, GF food trends – it’s everything you could ever want in a food magazine, that just so happens to be all gluten-free. Give your GF loved one an annual subscription for only $35. It’ll pay for itself after the first issue. What other foodie gifts are you giving your loved ones this holiday? Tell us in the comments below! 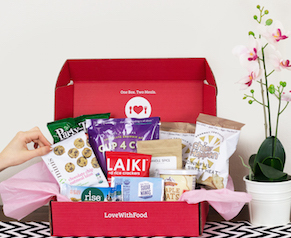 And don’t forget about Love With Food’s holiday sale – save $5 when you buy a subscription over $30 and use code JOY5 (and get a Rachael Ray Magazine subscription and $40 to spend on HelloFresh) and get 10% off your Love with Food shop order when you spend more than $50 and use code MERRY!